Christmas: It's not about outward conditions. It's about God's cure for our heart condition. Christmas in a mess of emotions and pressures? Jesus came to conquer evil and death! Celebrating Christ at Christmas frees us from false expectations of this world providing what we need. It reminds us how we cannot make Christmas. Only Jesus makes Christmas...Christmas! The world never serves up what we need. It's tough. But God sent Jesus to rescue us! The manger reminds us that outward conditions do not give the joy of Christmas. Jesus gives the joy! Inviting Him inside your heart grants you a fresh start. Believe. Repent. Receive. When we celebrate Him, we're never disappointed. He's the only One who never changes. He always stays. He remains good. He remains God! And check out the job description for Jesus in Isaiah 61:1-3. In this week's special Christmas edition, we include the simplest yet most spectacular message of all time: the Gospel! Come to God on His terms. You never know when will be the "last day" so learn more here about how to be sure you're saved: http://www.prayingpals.org/knowgod.html. 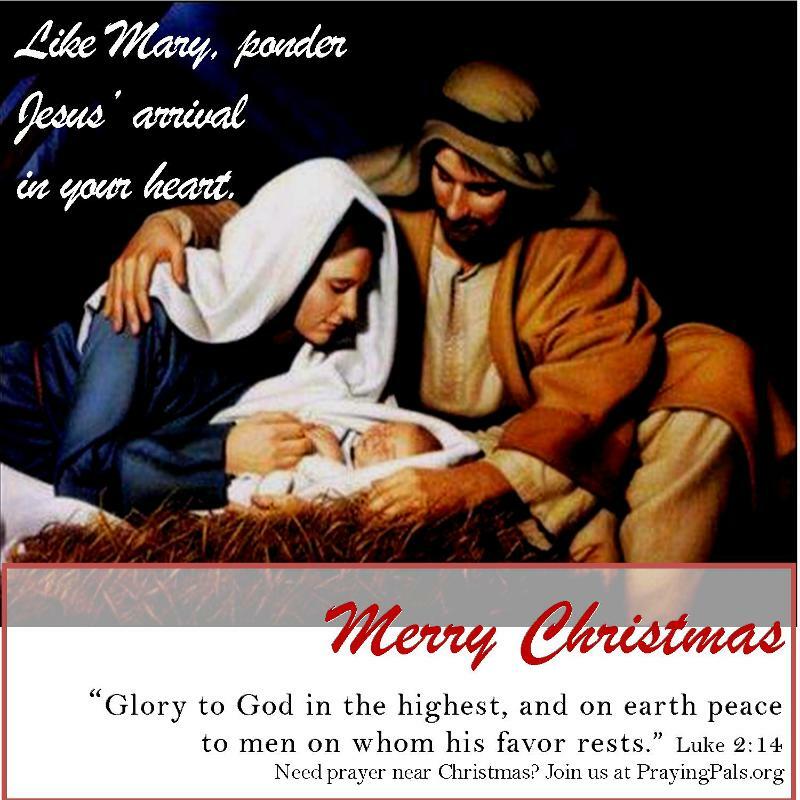 Have a blessed Christmas celebrating Jesus, our unconquerable King of kings and Lord of lords! "Heavenly Father, You are very, very awesome beyond compare! Thank You for sending Your Son, Jesus, who lived perfectly, took our capital punishment on the cross for our sins, and rose from the dead conquering sin and death. We worship You! We exalt Your Name this Christmas. We place all prayer requests sent to PrayingPals.org into Your hands and ask for Your best for each request. We trust You with all of our concerns. We hand everything over now. We pray for our leaders, our defenders of freedom, and all members of PrayingPals.org and beyond. And, Lord, we pray for those in the midst of heartache. You alone know how to truly comfort hurting hearts. Your Word says that you bind up the wounds of the brokenhearted. We give You all our wounds and ask You to make us new in You. We rely on You for salvation. We repent of sins (like forgetting to pay attention to You in our busy days near Christmas). We drop everything and run to You, O King! We exalt You! We love You! In Jesus' Name, Amen." >>>Do you know Jesus as your personal Savior and Lord? He's the only Way to Heaven. He said so. Click here to learn how to know God and go to Heaven. Click here and pray over the prayer list with us! Pray with someone in a worse situation than yours. And thank Jesus for coming.